As regular readers will now my belly-busting days are now back in full swing. Regular circuit training is now back on the agenda and I am trying to eat clean at least 5 days a week. What I have struggled with most is the concept of eating more, but smaller, meals throughout the day. This still doesn’t totally gel with our routine but we are getting better at it. Increased exercise though automatically leads to increased appetite so I have been trying to come up with some clean-ish snacks. This is my favourite night-time treat with a cup of herbal tea. It is a bit of a hybrid recipe taken in part from a friend’s slimming world recipe and part from a recipe over at Eat Yourself Skinny. I would strongly recommend this site for more clean recipe ideas. I am NO baker but this requires one jug, one bowl, a wooden spoon, a baking tray and that is all. It is so very simple. And it’s truly yummy. If you do give it a whirl please let me know what you think. For more ‘clean and lean’ recipe ideas why not also check out my pinterest board? Don’t forget to follow as I will be continually adding to it over the next few months. Mix all of the above in the order listed together in a mixing bowl. Spread on a greased and lined baking tray. (I used Fry-light spray to grease). Bake for 20-25 minutes until golden and just firm. Allow to cool for ten minutes. Divide into 12 and allow to cool completely. What makes this even simpler is the fact everything can be measured with just one measuring jug and a few measuring spoons. It honestly could not be easier! will need to give this a try, can I substitute golden syrup or malt extract for the honey as I cant eat honey? Of course. Golden syrup would taste awesome! This looks great. I do like adding peanut butter to my flapjacks for some extra flavour. I will have to try this soon! YUM ! I remember making something similar last summer! So need to do it again! Oooo nice! I know what I am making with the kids when they get home from school ! 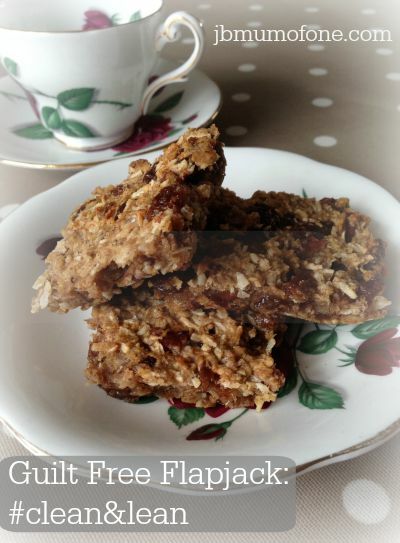 Anything guilt free sounds good to me! I am following SW so will give these a whirl. Thankyou x will defo give them a go!!! !